Thursday and Friday activities, including public presentations during the day and KASU Music Nights, will take place at the Dyess Colony Circle. 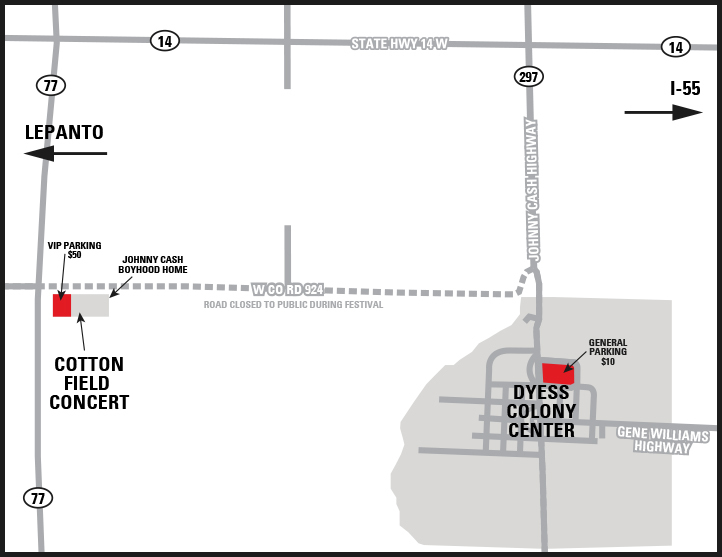 Parking is available at the Dyess Community Center, located on S. H. 297 (Johnny Cash Highway) between Elm and Fourth streets. If you have purchased an on-site parking pass for the Saturday concert, you will enter County Road 924 from S. H. 77 on the west side of the field. You must display your parking pass on your dashboard to gain entry. Maps showing parking locations and other details can be found below.